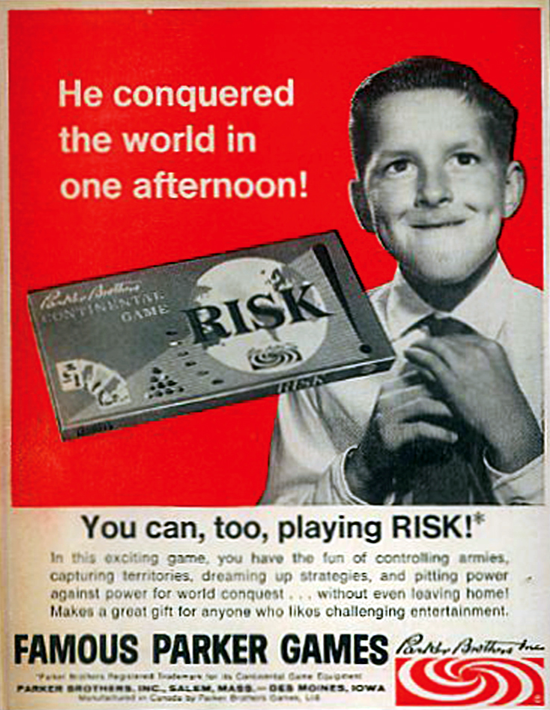 --- USA: 1959 as "Risk! 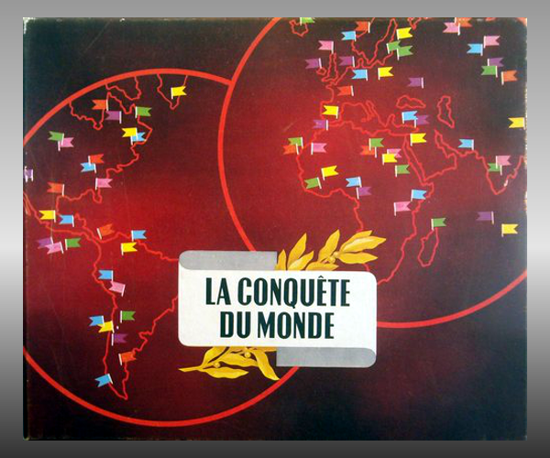 Continental Game"
--- A. 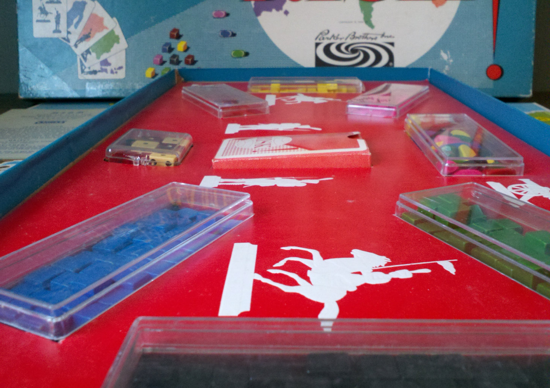 Six sets of playing pieces, each set of a different color, consisting of a box of cubes and several oblong pieces in a separate box. Each cube represents one army and the oblong pieces are equivalent to ten armies. 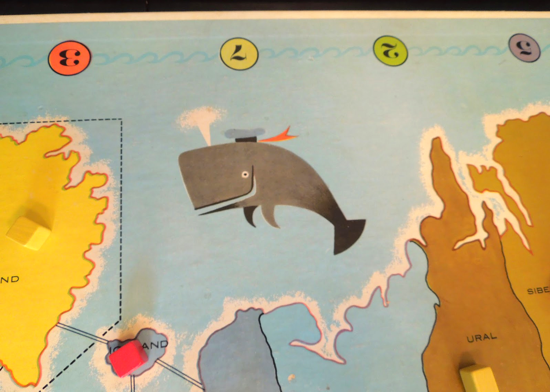 --- B. 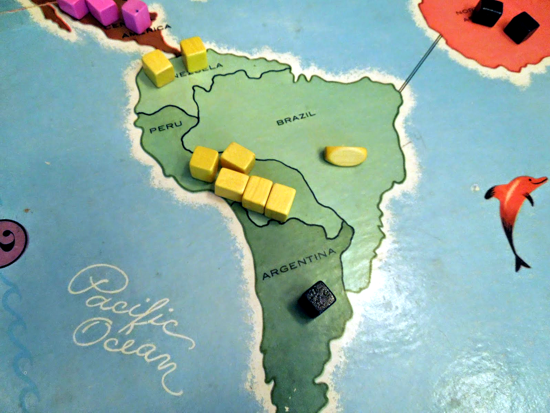 A playing board showing a map of the six continents, each of which is subdivided into a number of territories. 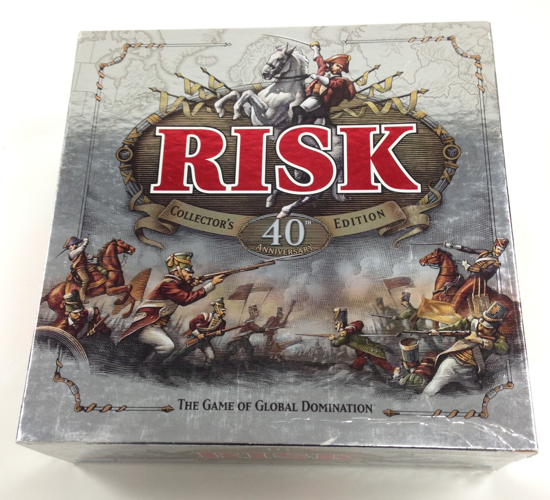 --- C. A deck of 44 cards plus one Trade-mark card which is not used in the play of the game. 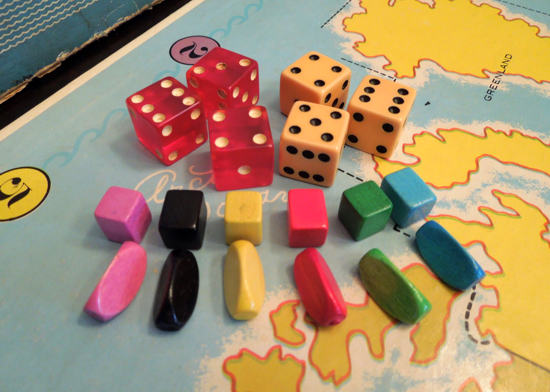 --- D. Six dice, 3 of which are red and 3 of which are ivory-colored. 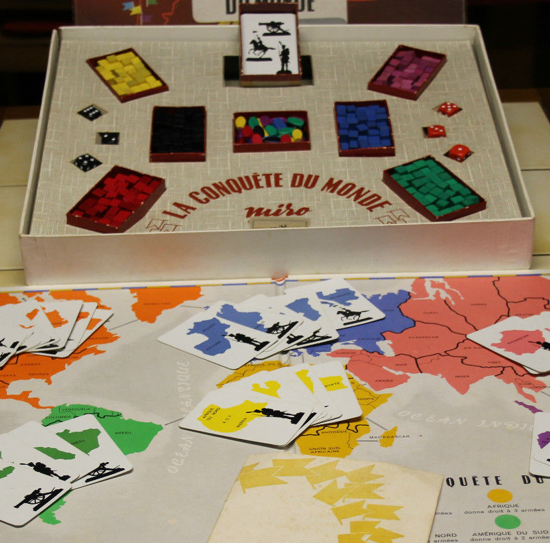 Interesting facts: During the 1950s, Parker Brothers formed an affiliation with the Miro Company in Paris for the manufacture and distribution of their games in France. 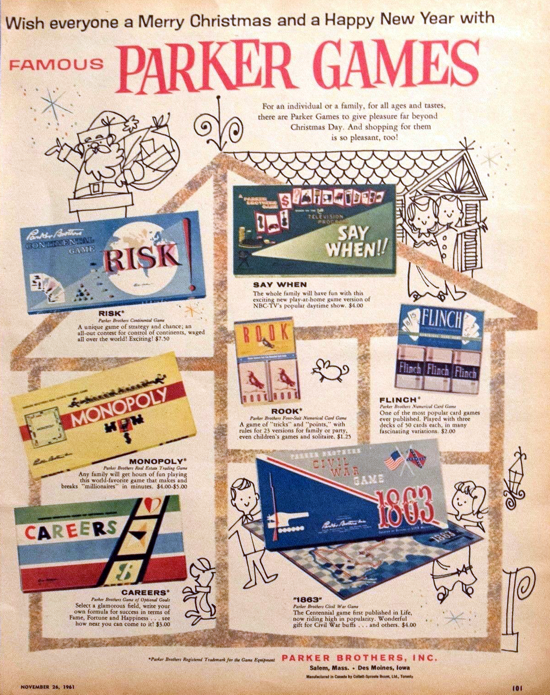 In exchange, Parker Brothers agreed to manufacture and distribute some of Miro's games in the United States. 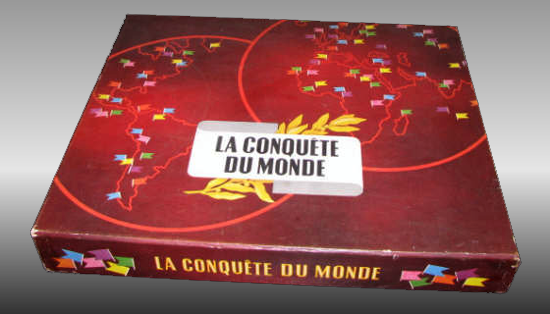 In the summer of 1957, Mr. Boisseau of Miro approached Parker Brothers with "La Conquête du Monde" (The Conquest of the World), a game invented by French filmmaker, film producer, and writer Albert Lamorisse, best known for his award-winning short films like "Le Ballon rouge" (The red balloon, 1956). 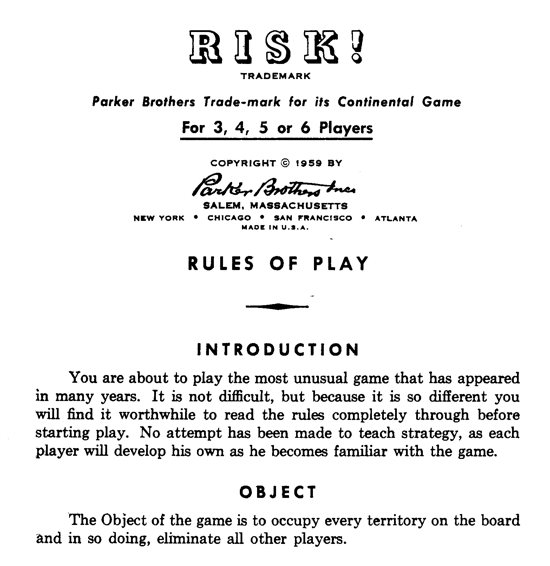 After extensive testing, the French game's rules were adapted for American tastes, and, in 1959, Parker Brothers launched "Risk! 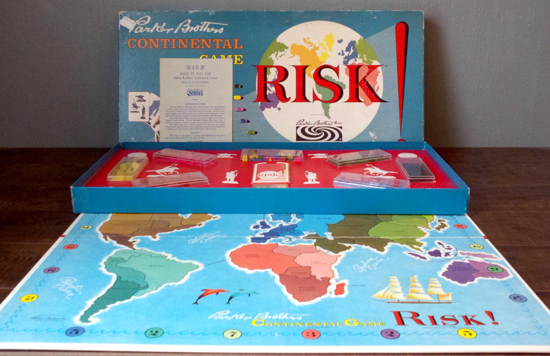 Continental Game". 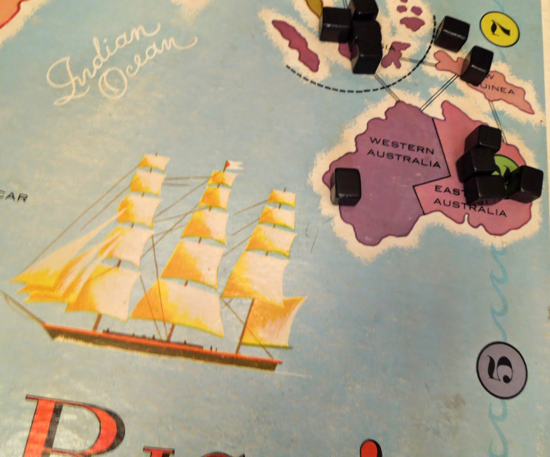 Through the years, the game has become a household name all around the world. 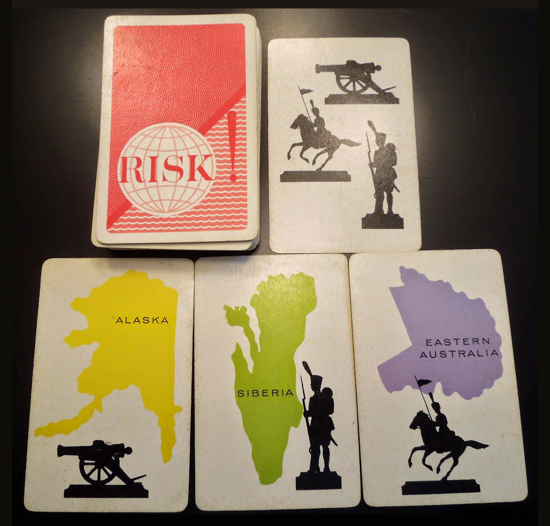 In addition to the original version of 1959, a number of official variants and not-licensed clones of Risk have been produced over the years. 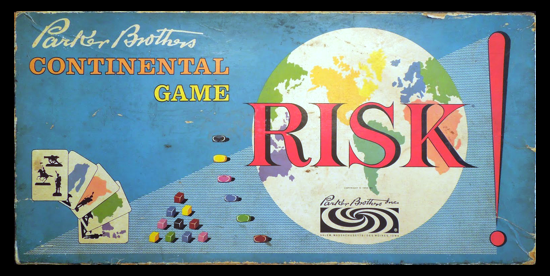 Hasbro bought Miro Company in 1986, and subsequently Parker Brothers in 1991. 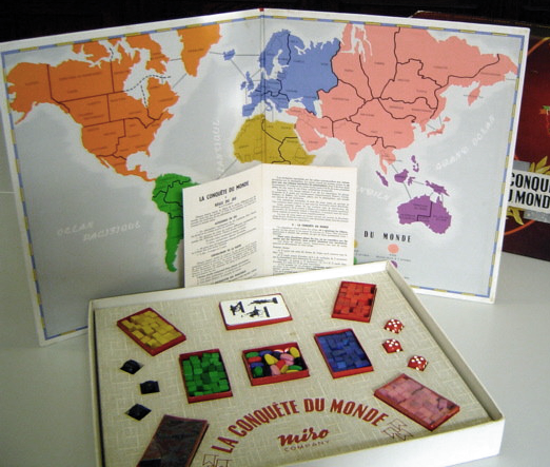 Property: Miro Company - Parker Brothers - Hasbro, Inc.
Albert Lamorisse (Paris, January 13, 1922 - Karaj, June 2, 1970), the French filmmaker, film producer, and writer, who invented the board game "La Conquête du Monde" (The Conquest of the World) in 1957, original version of the game Risk. 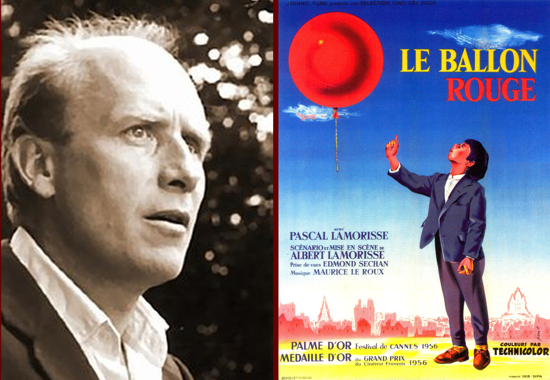 Lamorisse is best known for his award-winning short films, like "Le Ballon rouge" (The red balloon, 1956), which won numerous awards, including an Oscar for Lamorisse for the best original screenplay, and the Palme d'Or for short films at the Cannes Film Festival. 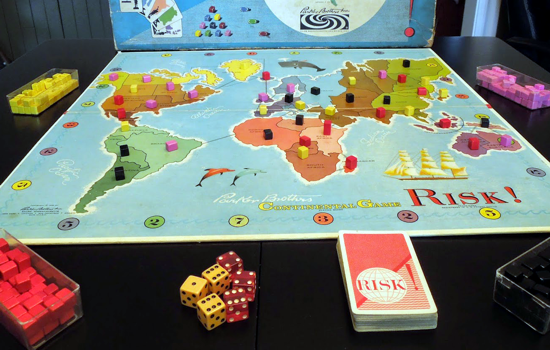 Hasbro celebrate 40 years of Risk (1959-1999) with a Collector's Edition which features a color-enhanced board and the troop pieces made of metal rather than plastic.